This weekend I took my first steps toward realizing a dream I have been thinking about for years! I am proud, excited, and desperately exhausted….. When my husband suffered a debilitating heart attach 3 years ago, our lives turned upside down. He could no longer physically handle the work he loved, growing apples and peaches with his family on the family orchard. He was forced to make a change in his life. I am now facing a change in my life too. I have been employed at a school for almost 20 years, but come the end of this school year, I will not be returning. I need to forge a new path and with my family’s help, I intend to make it happen. Ultimately I want visitors to bring their families to our farm and stay a few days, experiencing nature, working in the garden, taking care of animals, and learning how to take better care of themselves and their children. Big dreams take time and hard work. Over the past few years, we have been making improvements on our farm with the intent of transforming the place into an inviting learning center. We are not there yet, but phase two, getting people to the farm for short visits is my next goal. This weekend I entered phase two. I rented a booth at an artisan show and displayed homemade olive oil and goat milk soap, castor oil shampoo bars, and farm fresh eggs, along with a few other hand made products. 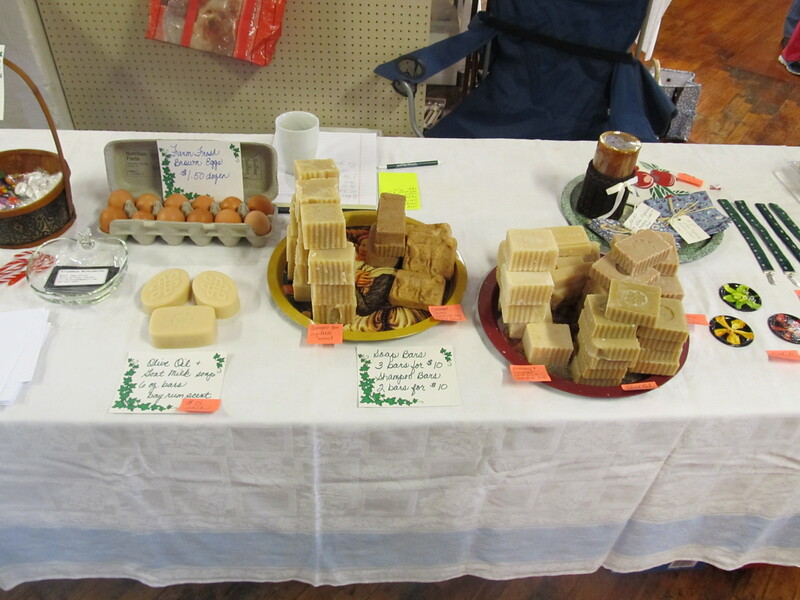 I gave demonstrations on making natural cleaning products and making soap. I shared my dream and desire to teach anyone who wanted to learn about the skills I’ve gained over my lifetime. The chance to offer workshops to help people gain new life skills is one step closer to becoming a reality. My husband and I are beginning a new journey and we are feeling both excited and scared to death. Wish us luck and send words of encouragement…please. I know the knowledge my husband and I have to share is valuable. I just hope we have the chance to share it with others and make a difference. This entry was posted in Animal Care, bath and body products, DIY, food preservation, gardening, Health, Household, Life's Simple Pleasures and tagged food preservation, Learn about farm life, soapmaking, working towards a dream. Bookmark the permalink. Liz: Best of luck – stop in and let us know what you are doing. Are you in Dearborn County? If so we can maybe help you. Also I was reading that you make olive oil soap – is that with goat milk? If so that’s the best of both worlds – and I’m interested in getting some. Do you have shampoo bars with the olive oil? Our director is interested in something like that. I do make olive oil soap with goat milk. The shampoo bars I have made so far are with castor oil and jojoba…..I’ll see if I can find an olive oil recipe…..
Maybe I’ll stop by sometime and spend a few minutes talking with you about my venture….Thanks! Lovely display, good luck with your new venture! I’m trying to learn how to make my own soap etc. and just came across your site. I’d love to bring my (large, non-wealthy) family to your farm when you’re ready. Great! I hope to welcome guests to the farm in the next few months and will introduce the program in a post. I look forward to meeting you and your family soon. After I originally commented I clicked the -Notify me when new comments are added- checkbox and now every time a comment is added I get four emails with the same comment. Is there any means you may take away me from that service? Thanks! So sorry for the extra mail you have been getting. I will follow up with this concern and see if I can get it corrected! After research a number of of the blog posts in your web site now, and I really like your manner of blogging. I bookmarked it to my bookmark website record and will likely be checking back soon. Pls try my web page as nicely and let me know what you think. Great – I should definitely say I’m impressed with your web site. I had no trouble navigating through all tabs as well as related info. It ended up being truly simple to access. Nice job. Heya i’m for the primary time here. I found this board and I find It truly helpful & it helped me out a lot. I’m hoping to offer something again and aid others such as you aided me. Have you ever considered writing an e-book or guest authoring on other sites? I have a blog based upon on the same topics you discuss and would really like to have you share some stories/information. I know my audience would appreciate your work. If you are even remotely interested, feel free to shoot me an e mail. You made some respectable points there. I seemed on the web for the issue and located most individuals will go together with together with your website. Nice post. I study one thing more challenging on totally different blogs everyday. It can all the time be stimulating to read content from other writers and apply a bit of one thing from their store. I’d want to use some with the content material on my blog whether you don’t mind. Natually I’ll give you a hyperlink on your net blog. Thanks for sharing. This is the best blog for anybody who wants to seek out out about this topic. You realize so much its almost onerous to argue with you (not that I truly would want…HaHa). You undoubtedly put a brand new spin on a topic thats been written about for years. Great stuff, simply nice! Oh my goodness! Amazing article dude! Thank you, However I am going through issues with your RSS. I don’t know the reason why I am unable to subscribe to it. Is there anybody having similar RSS issues? Anyone that knows the solution can you kindly respond? Thanx!! This is generally a good time to lie down along with rest! I are crazy about this time of season! Thank you with regard to the manageable read. I will certainly be definitely back for additional. This is a wonderful world-wide-web page, may possibly one considering completing a conversation related to just how you actually developed the idea? If they do e-mail me! Mrs. B, you know I think you rock! Good luck with anything and everything you do! I know you very well, and know that if anyone can make something happen, you can! I hope that I can bring the kids out to your farm when you are ready for visitors. Even though they live on a farm of their own, they would think that going to yours would be the COOLEST thing!! Lots of love!! Thank you Amber! I’ll let you know when we open the gates….. I am typically to running a blog and i really appreciate your content. The article has actually peaks my interest. I’m going to bookmark your site and hold checking for brand new information. Howdy I am so grateful I found your weblog, I really found you by accident, while I was researching on Aol for something else, Regardless I am here now and would just like to say many thanks for a tremendous post and a all round entertaining blog (I also love the theme/design), I don’t have time to look over it all at the moment but I have saved it and also added your RSS feeds, so when I have time I will be back to read a lot more, Please do keep up the great job. Its like you learn my thoughts! You appear to understand so much about this, like you wrote the ebook in it or something. I believe that you simply could do with some % to power the message house a bit, but other than that, that is wonderful blog. A fantastic read. I will certainly be back. An interesting discussion is definitely worth comment. I do think that you need to write more on this subject matter, it might not be a taboo subject but generally people do not talk about such topics. To the next! Cheers!! I agree with you that people frequently do not put their fears about making a successful life, “out there” for the whole world to see. I am a realist, however, and I am an educator. These characteristics enable me to be quite frank. I will consider your suggestion to delve into the subject in a subsequent post….thank you for vote of confidence. Awesome post! Found you while searching Yahoo and glad that I did. Some really superb info , Gladiolus I found this. Hello there! This blog post couldn’t be written any better! Going through this post reminds me of my previous roommate! He always kept talking about this. I am going to send this article to him. Pretty sure he’s going to have a very good read. Thank you for sharing! Thank you for the kind words. I am so glad to hear there are others think this venture has a chance! Thanks for sharing with your roommate. I Think your Blog has informative contents. I should say thanks to you to write these type of researched contents. Engaging read and also the theme was good. Thank you with respect to writing this editorial! I will definitely be back with regard to even more! Intriguing read and also the subject was good. Thank you for composing this column! I am going to be actually back with regard to more! Hi! I’ve been following your blog for some time now and finally got the courage to go ahead and give you a shout out from New Caney Tx! Just wanted to mention keep up the good job! I precisely wanted to thank you so much again. I am not sure what I could possibly have undertaken in the absence of those tips and hints documented by you about such area. It previously was an absolute distressing situation in my circumstances, but taking a look at the skilled mode you solved that took me to leap for joy. I am grateful for your work and even believe you really know what a great job you happen to be doing instructing some other people through the use of your blog. I know that you’ve never got to know any of us. I blog often and I genuinely appreciate your information. This great article has truly peaked my interest. I’m going to take a note of your blog and keep checking for new details about once per week. I subscribed to your RSS feed as well. I like this website its a master peace ! Glad I discovered this on google. “Don’t spend time beating on a wall, hoping to transform it into a door.” by Dr. Laura Schlessinger. Hi there I just think you have a fantastic blog going at this point, I found it on Msn and plan on returning consistently for the info that you all are providing.|Many thanks for helping to make my evening a tiny touch much better with this fantastic article!nice post! Enjoyable read as well as the topic was good. Thank you with respect to publishing this piece! I will be back with regard to extra! Enjoyable read as well as the subject was good. Thank you with respect to creating this blog! I am going to be actually back with regard to additional! Magnificent beat ! I wish to apprentice whilst you amend your website, how can i subscribe for a blog web site? The account helped me a appropriate deal. I have been tiny bit acquainted of this your broadcast offered brilliant clear idea. Rattling nice pattern and wonderful subject material, nothing at all else we want :D.
I really enjoy looking at on this web site , it holds fantastic blog posts. “Do what you fear, and the death of fear is certain.” by Anthony Robbins. Some genuinely fantastic information, Sword lily I discovered this. “Never put off until tomorrow what you can do the day after tomorrow.” by Mark Twain. Its superb as your other content : D, thanks for posting . “Reason is the substance of the universe. The design of the world is absolutely rational.” by Georg Wilhelm Friedrich Hegel. Your style is so unique compared to other folks I’ve read stuff from. Thanks for posting when you’ve got the opportunity, Guess I will just book mark this site. Some truly wonderful blog posts on this web site , thanks for contribution. Youre so cool! I dont suppose Ive read something like this before. So nice to seek out anyone with some authentic ideas on this subject. realy thanks for beginning this up. this web site is one thing that’s needed on the net, somebody with a bit originality. useful job for bringing one thing new to the web! A person essentially help to make seriously articles I would state. This is the first time I frequented your web page and thus far? I amazed with the research you made to make this particular publish extraordinary. Excellent job! Regards for all your efforts that you have put in this. very interesting information. “I am the wisest man alive, for I know one thing, and that is that I know nothing. (Plato’s Apology)” by Socrates. Show me more, it was nice to read your article. Keep up the superb work, I read few articles on this site and I conceive that your website is very interesting and contains circles of wonderful info. Its superb as your other blog posts : D, appreciate it for putting up. “A lost battle is a battle one thinks one has lost.” by Ferdinand Foch. Garlic like damp soil, however, not extremely moist. Let them have a number of eco-friendly fertilizer. Start piecing together the berry stand now. Sell your own plant to the side of the trail. I’ll cease for garlic, however, not lemonade. Hello. Neat post. There’s an issue with the site in chrome, and you might want to test this… The browser is the marketplace leader and a large portion of other folks will omit your wonderful writing due to this problem. I actually wanted to send a small word to be able to thank you for all of the pleasant pointers you are posting at this website. My extensive internet research has at the end of the day been rewarded with pleasant facts to exchange with my contacts. I ‘d say that we visitors actually are extremely lucky to live in a really good website with many wonderful individuals with interesting ideas. I feel rather fortunate to have discovered your webpage and look forward to tons of more fabulous times reading here. Thank you again for everything. I would love to have you share my blog on Twitter. Thank you. love your site as well as my daughter Katty because if the information you provide us with. thanks and i bookmarked and shared your site on my facebook wall. Thank you for sharing my blog with others you know! I appreciate the help. Thank you so much for giving everyone an extraordinarily superb chance to read in detail from here. It’s always very superb and as well , packed with a good time for me and my office peers to visit your web site minimum 3 times in 7 days to read through the newest guides you have got. And lastly, I’m just actually pleased with the brilliant thoughts you give. Selected 2 areas on this page are undeniably the finest we have all had. Interesting read as well as the subject matter was good. Thank you with regard to publishing this editorial! I will certainly be back with regard to extra! Can I quote this article? Yes. Thank you for your interest. Fascinating take on this subject, is it ok if I reference this on my article? Yes you may reference this article. Thank you for stopping by. I have been browsing for this info for a very long time and ultimately happened upon your site! Thanks for all the fantastic tips, this site rocks! This was most inspirational. It is a beautifuly produced and informative program. The photography is spectacular. I wish my grandson was old enough to appreciate it. If you add a “like” I’d put this over Google Plus. Liz, all the best to you and Russ. I have complete faith in the both of you and know you will make it work. Your are both awesome people and I am so happy you are going to share your knowledge with us. Thank you for the words of encouragement! I’ll let you know when the blackberries and raspberries are ready for picking next year……… . I’m impressed, I must say. Seldom do I encounter a blog that’s both equally educative and interesting, and let me tell you, you’ve hit the nail on the head. The problem is an issue that too few people are speaking intelligently about. Now i’m very happy I came across this in my search for something concerning this. My partner and I stumbled over here from a different web page and thought I may as well check things out. I like what I see so now i’m following you. Look forward to going over your web page yet again. I’ve gone ahead and bookmarked https://quarteramish.com/2012/03/11/making-dreams-takes-hard-work/ at Digg.com so my friends can see it too.Â I simply used Making Dreams Takes Hard Work | Quarter Amish as the entry title in my Digg.com bookmark, as I figured if it is good enough for you to title your blog post that, then you probably would like to see it bookmarked the same way. Thanks for sharing my site! I have been absent for some time, but now I remember why I used to love this site. Thanks, I’ll try and check back more often. How frequently do you update your website? I try to update every 7-10 days or less. Hi! I simply would like to give you a huge thumbs up for the great information you’ve got right here on this post. I am coming back to your blog for more soon. I’d have to test with you here. Which isn’t one thing I normally do! I get pleasure from reading a put up that may make folks think. Also, thanks for allowing me to comment! I’m still learning from you, while I’m improving myself. I definitely love reading everything that is posted on your website.Keep the aarticles coming. I liked it! Nice read, I just passed this onto a friend who was doing some research on that. And he actually bought me lunch as I found it for him smile Therefore let me rephrase that: Thanks for lunch! “We know what happens to people who stay in the middle of the road. They get run over.” by Ambrose Gwinett Bierce. This is really fascinating, You’re a very skilled blogger. I have joined your rss feed and sit up for in quest of more of your wonderful post. Also, I’ve shared your website in my social networks! Hi, I do believe this is a great web site. I stumbledupon it 😉 I am going to revisit once again since I saved as a favorite it. Money and freedom is the best way to change, may you be rich and continue to guide other people. Genuinely educational thanks, It is my opinion your trusty readers could quite possibly want considerably more articles similar to this carry on the excellent content. Really enjoyed this article, can I set it up so I receive an alert email whenever you make a fresh article? You can subscribe to the blog in order to get notification when a new post is listed. thank you! That is the precise weblog for anybody who needs to find out about this topic. You notice so much its nearly exhausting to argue with you (not that I really would want…HaHa). You definitely put a brand new spin on a topic thats been written about for years. Great stuff, simply nice! I really wanted to make a brief comment to be able to appreciate you for these nice strategies you might be giving out on this site. My particularly long internet appear up has lastly been compensated with reliable content material to go more than with my neighbours. I â€˜d say that numerous of us readers are undoubtedly endowed to be in an excellent network with so many marvellous individuals with beneficial techniques. I feel truly privileged to have used your entire website and look forward to so many far more awesome minutes reading here. Thank you once more for a lot of items. I would be glad for you to share with your friends. Hello there, You’ve done an incredible job. I will certainly digg it and personally recommend to my friends. I am sure they’ll be benefited from this website. Your article has definitely inspired me to re think my way of writing. Just saying thanks for your hard work. Good info. Lucky me I found your blog by chance (stumbleupon). I’ve bookmarked it for later! Wow, thank you for such a great post! Hrmm that was weird, my comment got eaten. Anyway I wanted to say that it’s nice to know that someone else also mentioned this as I had trouble finding the same info elsewhere. This was the first place that told me the answer. Thanks. OH by the way, feel free to submit your blog to my Free Directory. It will boost your visitors and backlinks! How To Clean Trout is a great website to learn all about how to prepare trout fish after fishing. Wonderful work! Exceptional post nonetheless , I was wanting to know if you could write a litte far more on this topic? Iâ€™d be really thankful in the event you could elaborate a little bit more. Thanks! Excellent items from you, man. I have consider your stuff previous to and you are simply extremely wonderful. I really like what you’ve bought here, certainly like what you’re stating and the way by which you are saying it. You’re making it enjoyable and you continue to care for to stay it smart. I can’t wait to read much more from you. That is actually a wonderful website. Helpful info. Lucky me I discovered your web site by chance, and I’m stunned why this accident did not came about earlier! I bookmarked it. I like this site its a master peace ! Glad I noticed this on google. “Observe your enemies, for they first find out your faults.” by Antisthenes. Check the toolbar of your browser….there should be a link to follow, subscribe, etc. That’s all there should be to subscribing. Thanks for stopping by. I like the helpful info you provide in your articles. I¡¦ll bookmark your blog and check again here frequently. I’m quite certain I will learn many new stuff right here! Good luck for the next! Hey there! This is my first comment here so I just wanted to give a quick shout out and tell you I truly enjoy reading your blog posts. Can you suggest any other blogs/websites/forums that go over the same subjects? Thanks a ton! I like the helpful info you provide in your articles. I¡¦ll bookmark your blog and check again here regularly. I am quite sure I will learn plenty of new stuff right here! Good luck for the next! I leave a comment whenever I appreciate a article on a site or if I have something to valuable to contribute to the discussion. It’s caused by the sincerness displayed in the post I looked at. And on this article Making Dreams Takes Hard Work | Quarter Amish. I was actually excited enough to drop a leave a responsea response 😉 I do have 2 questions for you if you don’t mind. Is it just me or do a few of the remarks come across like written by brain dead visitors? 😛 And, if you are writing on other social sites, I would like to keep up with anything new you have to post. Could you make a list all of your communal pages like your twitter feed, Facebook page or linkedin profile? Thanks on your marvelous posting! I quite enjoyed reading it, you can be a great author.I will be sure to bookmark your blog and will eventually come back very soon. I want to encourage you to continue your great posts, have a nice morning! This post gives truly quality information. I’m definitely going to look into it. Really very useful tips are provided here. thank you so much. Fantastic post, I like how you explain the info. I am gonna add your blog to favorites and keep reading it. Good luck and keep the good work. Hi there! I simply would like to give a huge thumbs up for the good info you’ve got right here on this post. I shall be coming again to your blog for extra soon. Enormously educational thanks, I do believe your visitors will likely want further blog posts like this maintain the excellent effort. I used to be very pleased to search out this net-site.I wished to thanks to your time for this glorious learn!! I positively having fun with each little little bit of it and I’ve you bookmarked to take a look at new stuff you blog post. Your words are very kind. I feel one of your ads triggered my internet browser to resize, you may want to put that on your blacklist. Ha ha… I was just online around and took a glimpse at these responses. I can’t believe there’s still this much interest. Thanks for crafting articles about this. Guess that goes to show you that great minds think alike! I would like to thnkx for the efforts you’ve put in writing this web site. I am hoping the same high-grade blog post from you in the upcoming also. Actually your creative writing abilities has encouraged me to get my own web site now. Really the blogging is spreading its wings fast. Your write up is a good example of it. Its good as your other posts : D, appreciate it for posting . Wonderful site. A lot of helpful info here. I am sending it to a few pals ans additionally sharing in delicious. And obviously, thanks for your sweat! Hello to every body, it’s my first visit of this weblog; this webpage consists of amazing and genuinely fine data in favor of visitors. Extremely interesting points you’ve got remarked, appreciate it for putting up. Hello! I just want to give a huge thumbs up for the good data you’ve gotten right here on this post. I will be coming back to your blog for extra soon. You could definitely see your skills in the paintings you write. The sector hopes for even more passionate writers like you who aren’t afraid to say how they believe. All the time go after your heart. “Man is the measure of all things.” by Protagoras. Greetings from Florida! I’m bored to tears at work so I decided to check out your website on my iphone during lunch break. I enjoy the info you present here and can’t wait to take a look when I get home. I’m surprised at how fast your blog loaded on my cell phone .. I’m not even using WIFI, just 3G .. Anyways, great site! Hi there. Very nice site!! Guy .. Excellent .. Superb .. I’ll bookmark your blog and take the feeds also…I am satisfied to find so much helpful information here in the article. Thank you for sharing..
Hiya, I am really glad I’ve found this info. Today bloggers publish only about gossips and net and this is really irritating. A good web site with interesting content, this is what I need. Thank you for keeping this web-site, I will be visiting it. Do you do newsletters? Can not find it. It appears that you’ve put a good amount of effort into your article and I demand a lot more of these on the web these days. I sincerely got a kick out of your post. I do not have a bunch to say in reply, I only wanted to register to say, great work! Hi there! I just want to give a huge thumbs up for the nice data you may have right here on this post. I will be coming again to your weblog for more soon. Heya i am for the primary time here. I came across this board and I find It truly useful & it helped me out a lot. I am hoping to present one thing again and aid others like you aided me. Very informative and great complex body part of content , now that’s user pleasant (:. This article for sure saved me thank you. I really have been seeking on tons of websites! I emailed it with a all my students since I read it. Thanks for this article. This was a truly absorbing article. Thanks over again – I will visit again. This is a terrific web site, could you be interested in performing an interview about just how you developed it? If so e-mail me! Excellent post. I was checking continuously this blog and I’m impressed! Extremely helpful info particularly the last part 🙂 I care for such information a lot. I was seeking this certain info for a very long time. Thank you and best of luck. I was studying some of your content on this site and I think this web site is really informative! Keep posting. I am not very good with English but I get hold this rattling easygoing to read . Thanks for sharing excellent informations. Your web site is so cool. I’m impressed by the details that you’ve on this site. It reveals how nicely you perceive this subject. Bookmarked this website page, will come back for more articles. You, my friend, ROCK! I found just the information I already searched all over the place and just could not come across. What a great site. Hello there! This is my 1st comment here so I just wanted to give a quick shout out and tell you I truly enjoy reading your blog posts. Can you suggest any other blogs/websites/forums that go over the same subjects? Many thanks! Good post. I study one thing tougher on different blogs everyday. It’ll at all times be stimulating to read content material from other writers and follow a little bit one thing from their store. I’d prefer to make use of some with the content material on my weblog whether you don’t mind. Natually I’ll provide you with a link on your internet blog. Thanks for sharing. Thanks a good deal for sharing this with all people today you truly understand what you are talking about! Bookmarked. Please additionally consult with my website =). We may perhaps have a hyperlink exchange agreement among us! Wow! This could be one of the most useful blogs we’ve ever come across on the subject. Actually great nfo! I’m also an expert in this topic so I can understand your hard work. Does your site have a contact page? I’m having trouble locating it but, I’d like to send you an email. I’ve got some ideas for your blog you might be interested in hearing. Either way, great blog and I look forward to seeing it expand over time. I’m amazed, I have to admit. Seldom do I encounter a blog that’s both educative and interesting, and without a doubt, you’ve hit the nail on the head. The problem is something that not enough people are speaking intelligently about. I am very happy that I stumbled across this during my hunt for something concerning this. Thanks a ton for the good writeup. Mind you, how could we communicate? Greetings! Very useful advice in this particular post! It is the little changes that will make the most significant changes. Thanks a lot for sharing! Effectively written write-up, Glad I’m able to locate a web site with some expertise plus a terrific writing style. You maintain publishing and I will contiune to maintain browsing. Exceptional post. I was checking constantly this blog and Iâ€™m impressed! Extremely beneficial data specially the last part I care for such details considerably. I was seeking this particular data for a long time. Thank you and greatest of luck. Hey! I simply wish to give a huge thumbs up for the great info you’ve here on this post. I will be coming back to your weblog for more soon. I like what you guys are up too. This kind of clever work and coverage! Keep up the amazing works guys I’ve incorporated you guys to my own blogroll. Keep up the excellent work , I read few articles on this internet site and I believe that your web site is very interesting and has lots of great info . Thanks for sharing excellent informations. Your web-site is so cool. I’m impressed by the details that you’ve on this blog. It reveals how nicely you understand this subject. Bookmarked this website page, will come back for extra articles. You, my friend, ROCK! I found just the info I already searched everywhere and just could not come across. What a perfect web-site. I am not really good with English but I come up this real leisurely to understand. Really Appreciate this post, can you make it so I receive an email sent to me every time you publish a new article? I believe this web website contains really superb composed articles posts . I enjoy you because of all of the labor on this web site. Kate really loves setting aside time for investigations and it’s easy to understand why. We all hear all concerning the dynamic method you provide effective tips via this website and as well as attract participation from people about this content plus our own simple princess is certainly learning a lot. Enjoy the remaining portion of the year. Your performing a pretty cool job. What’s Happening i am new to this, I stumbled upon this I’ve found It absolutely helpful and it has aided me out loads. I hope to contribute & aid other users like its helped me. Good job. Excellent site. Plenty of useful info here. I am sending it to a few friends ans also sharing in delicious. And of course, thanks in your sweat! Howdy! I know this is kinda off topic however , I’d figured I’d ask. Would you be interested in trading links or maybe guest writing a blog article or vice-versa? My blog discusses a lot of the same subjects as yours and I feel we could greatly benefit from each other. If you are interested feel free to shoot me an email. I look forward to hearing from you! Fantastic blog by the way! I seriously don’t ordinarily provide feedback on a great deal of blogging sites, but the quality of this piece of writing made it just impossible for me not to give my appreciation for the amount of investigation you without a doubt placed into this content. Greetings, Eldon Polkinghorn here! Definitely, this blog which came from the yahoo search and the information you showed is reliable and interesting. I got alot from your insights and points. A really cool blog to read, thank you very much for your time in writing this article. Thanks for another excellent article. Where else could anybody get that kind of information in such an ideal way of writing? I have a presentation next week, and I am on the look for such information. This is the fitting blog for anyone who wants to seek out out about this topic. You realize so much its almost arduous to argue with you (not that I really would want…HaHa). You positively put a new spin on a subject thats been written about for years. Great stuff, just great! I appreciate posting this information. Your blog post is certainly so wonderful we always view it for new updates. It’s a shame you don’t have a donate button! I’d certainly donate to this outstanding blog! I suppose for now i’ll settle for book-marking and adding your RSS feed to my Google account. I look forward to brand new updates and will share this site with my Facebook group. Chat soon! Does your blog have a contact page? I’m having a tough time locating it but, I’d like to send you an e-mail. I’ve got some ideas for your blog you might be interested in hearing. Either way, great blog and I look forward to seeing it improve over time. My spouse and I absolutely love your blog and find most of your post’s to be exactly what I’m looking for. Would you offer guest writers to write content for yourself? I wouldn’t mind publishing a post or elaborating on a number of the subjects you write concerning here. Again, awesome web log! I have not twittered as of yet, but your suggestion has encouraged me to begin. Thanks. Look for a tweet in the future. Gosh I hope your sister plans to replace your ipad!!!! So sorry for your loss and I hope you and your sister can get through this. Excellent post. I was checking continuously this blog and I’m impressed! Extremely useful information specially the last part 🙂 I care for such info a lot. I was seeking this particular info for a long time. Thank you and best of luck. My son in law created the format of the blog but I created the theme picture from a picture I took myself. Thanks for the compliment! Good luck on beginning your own space. My brother recommended I might like this website. He was once entirely right. This post actually made my day. You can not consider just how a lot time I had spent for this information! Thank you! My son-in-law set mine up for me in about 30 minutes…..I think WordPress is pretty simple….go ahead and give it a try. You completed a few fine points there. I did a search on the issue and found the majority of persons will agree with your blog. Hey there! Someone in my Facebook group shared this site with us so I came to check it out. I’m definitely enjoying the information. I’m book-marking and will be tweeting this to my followers! Excellent blog and fantastic style and design. With havin so much content and articles do you ever run into any problems of plagorism or copyright violation? My site has a lot of exclusive content I’ve either authored myself or outsourced but it appears a lot of it is popping it up all over the web without my agreement. Do you know any ways to help protect against content from being stolen? I’d certainly appreciate it.